Holly Hunter Berry's Daily Dog Art: Let's Go Outside! What happened to "a day of rest"? This little boy, known as Snub, has plenty of energy and does not believe in resting! What is in dog food that gives such energy? I think I should look into the ingredients! I am sooooo happy to be back in my studio! There is never a shortage of things to learn and try, I love it! I have so many dogs that have asked to be painted, you never know who will be next. Your comments are always welcome as I would love to visit! 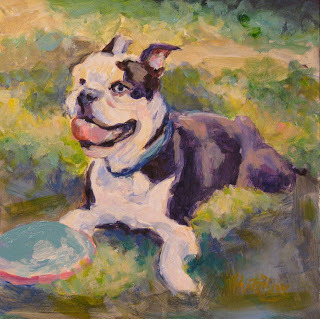 I love this happy painting of Snub and one of his collection of frisbees. He doesn't go anywhere without one. 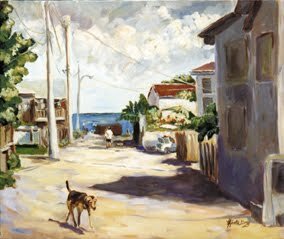 Every time I see this painting, I can see how how much fun he was having chasing his frisbee the day I took this picture.